This project is funded by the Office of Naval Research and the United States Marine Corps Warfighting Laboratory. For more information, please contact Larry Rosenblum. In the Dragon project we are developing a battlefield visualization system for displaying the Common Tactical Picture on the Responsive Workbench. The system displays a three-dimensional representation of the battlespace, which includes a terrain map, entities representing friendly, enemy, unknown, and neutral units, and symbology representing other features such as obstructions or key points in the plan of operations. Entities are represented both by schematic models as well as standard battlefield visualization symbols. Dragon receives electronic intelligence feeds which relate each entity's current status, including such information as position, current speed and heading, current damage condition, and so forth. As these reports are received, Dragon updates the corresponding models on the map. 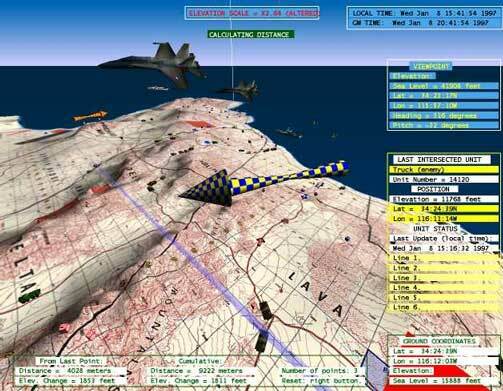 Users can view the battlespace in either monographic or stereographic mode, and navigate to observe the map and entities from any angle and orientation. They can also query and manipulate the entities. Gaining a detailed understanding of the modern battle space is vital to the success of any military operation. Any modern command center has access to a multitude of systems which provide information from many different sources. These disparate and sometimes conflicting information sources must be combined together to present a coherent tactical picture which can be rapidly disseminated to planners and decision makers. However, current visualization methods (often based on acetate overlays and grease pencils), fail to meet the needs of the Navy and Marine Corps. The Joint Chief of Staff recognizes the Department of Defenseï¿½s new for new capabilities in the visualization arena and has recently approved a visualization mission needs statement based on the requirements of Joint Vision 2010 and the Defense Planning Guidance. See our presentation from the IEEE Visualization 1998 conference. the Joint Counter Mine Advanced Concept Tactical Demonstration (August 1997). A set of briefing slides gives more details. A CNN Headline news report on the Hunter Warrior AWE mentions the Dragon system. Jim Durbin, J. Edward Swan II, Brad Colbert, John Crowe, Rob King, Tony King, Chris Scannell, Zachary Wartell, Terry Welsh, "Battlefield Visualization on the Responsive Workbench", Proceedings IEEE Visualization '98, October 18-23, Research Triangle Park, North Carolina: IEEE Computer Society Press, 1998, pages 463-466. Jim Durbin, Simon Julier, Brad Colbert, John Crowe, Bob Doyle, Rob King, Tony King, Chris Scannell, Zachary Wartell, Terry Welsh, "Making Information Overload Work: The Dragon software system on a Virtual Reality Responsive Workbench" Proceedings of the 1998 SPIE AeroSense Conference, Vol. 3393, pp. 96-107, April 1998. Durbin, J., Doyle, R., Tate, D. and King, R., "Situational Awareness Using the VR Responsive Workbench", IEEE Computer Graphics and Applications, July/August 1997, 17(4), pages 12-13.